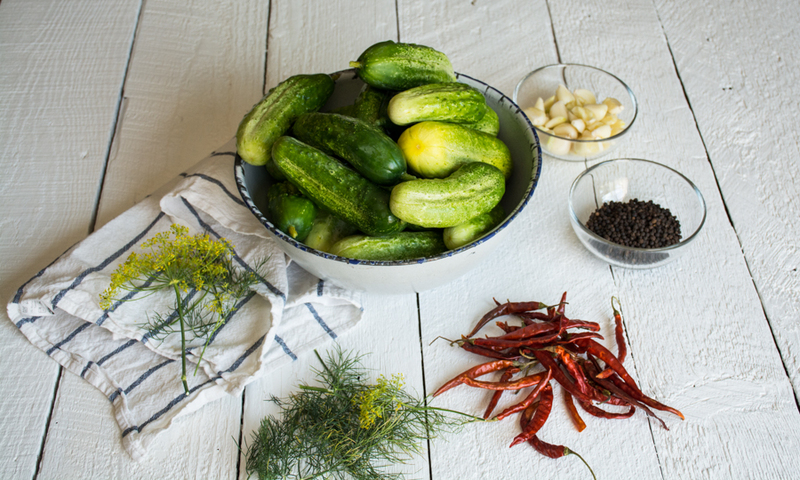 Summer + Canning Dill Pickles! They are tasty on a sandwich, a burger, or straight from the jar. I had no idea how easy they were to make…. Last year a friend gave us some cucs to pickle and that’s when I decided to grow them this year in our garden. We planted 12 cucumber plants and had plenty of cucs to pickle! In fact, we harvested another batch the other day that we need to pickle soon! They grow like zucchinis…one day they are tiny and the next a giant cucumber! They keep for a few weeks in the fridge in a plastic bag so you don’t need to pickle them right away. I can’t imagine making pickles 2-3 times a week! Yikes! We found out last year on our first batch, the secret to crisp pickles is soaking them overnight in water and pickling lime. This is a must for crisp pickles. Our first batch last year was well, a bit limp. A total bummer! Now we use pickling lime every time we make pickles. Fresh dill is also a key ingredient. Look for dill that is very fragrant, and you will need a lot. Go ahead and buy the tall stalks of dill you see this time of year at the markets. I promise, you will use it all! People ask us how we can so many jars at once. When we make a batch of canned goods, we go big! Get out all the gear and make a huge batch. With all the time and effort, I think it’s a waste of time and energy to do only a few jars at a time. I laugh when I see a recipe that says make 3-4 quarts! And when you have a garden…everything comes in big batches! We set up our 3 burner camp stove on the back patio. We can can in all 3 pots all at once. No heating up the house, and waiting between batches. And if you make a mess- hose down the patio! As you prep your cucs and wash them from the pickling lime, heat the water in the pots on the camp stove and by the time you are ready to can, the water will be ready. 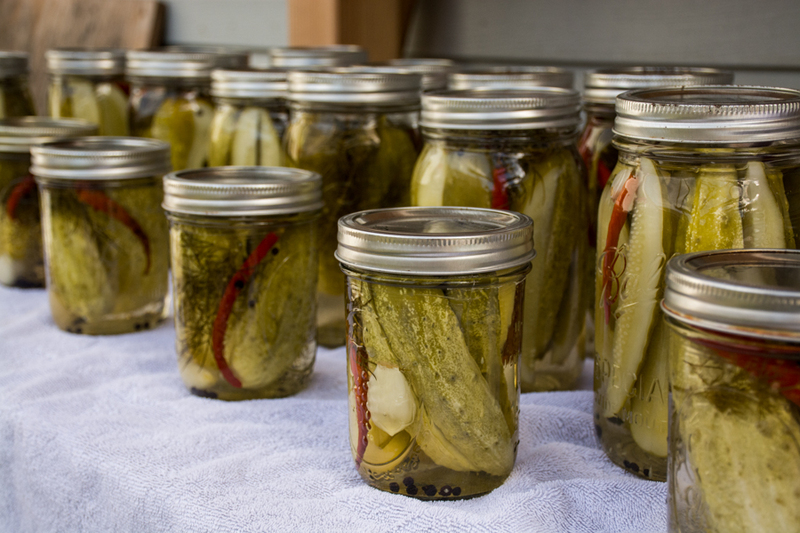 So far this summer, we have canned 48 jars of dill pickles and the cucs are still coming! Cheers to more canning and longer summers! 16 pounds of pickling cucumbers, enough to almost fill a 5 gallon bucket. In a 5 gallon food safe bucket, fill with while cucumbers and fill to the top with cold water. Stir in the pickling lime. Chill overnight in the refrigerator. When ready, sterilize jars and lids and get water bath ready. Rinse and scrub the cucumbers getting all the pickling lime off. If cucs are large, slice into desired spears or you can leave them whole. In each quart jar, fill with cucs, 2 cloves of garlic, 2 peppers, 3-4 peppercorns, and a handful of dill. I usually add one dill head to each jar too. In a large pot, bring to a boil, water, vinegar and pickling salt. Pour hot mixture into filled jars leaving 1/2 inch head space at the top. Place lids on, and boil the quart jars for 15 minutes each batch. If using pint jars, boil for 10 minutes. Store pickles in a cool dry place for one month before opening. Refrigerate after opening. Makes approximately 24 quarts, depending on the size of your pickles. Mmmm dill pickles are the best! I need to learn this pickling skill! I’m so scared to try and just need to do it. Those look AMAZING! What a great idea to do your canning outside with the camp stove! Whenever I’ve made jam, it heats up the whole apartment so it becomes unbearable. I haven’t done any canning yet this year but if we do I’ll have to use your trick! I have always wanted to make pickles! I will remember to soak them! My husband planted cucumbers this year…but then our drip system broke while were on vacation and they all died. Sigh! I’m sure he’ll try again next year and, if we have success, I’ll give pickling a try! Oh total bummer! We would be lost without our drip irrigation system!